Gibson London 'Marriott' men's 1960s mod windowpane check suit blazer in charcoal. 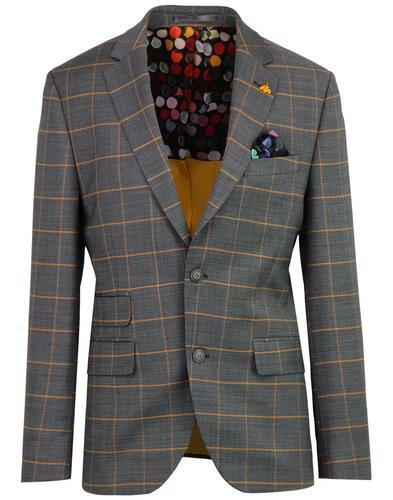 This fab retro textured suit jacket incorporates a striking orange window pane check design. Paying homage to 1950s Teddy Boy styling with bold check design, smudgy polka dot pocket liner to chest pocket adding a flash of colour and a striking under collar felt trim. Classic retro notch lapel, 2 button single breasted fastening, two flap pockets to sides and a mod right side ticket pocket. The striking dual fabric lining adds the finishing touch. Side vents and 4 button non-working cuffs. The Gibson London 'Marriott' 2 button mod window pane check blazer jacket looks great teamed with the matching V-neck waistcoat and slim leg trousers. The perfect 3 piece suit! - Gibson London 'Marriott' men's 60s mod windowpane check blazer jacket. - Retro orange windowpane check on textured charcoal ground. - 2 button single breasted fastening. - Gibson London bumble bee lapel pin. - SKU: G18105MNJ Marriott Windowpane Check Blazer Jacket. Composition: 52% wool, 46% polyester, 2% elastane. Lining 1: 100% viscose. Lining 2: 100% polyester. 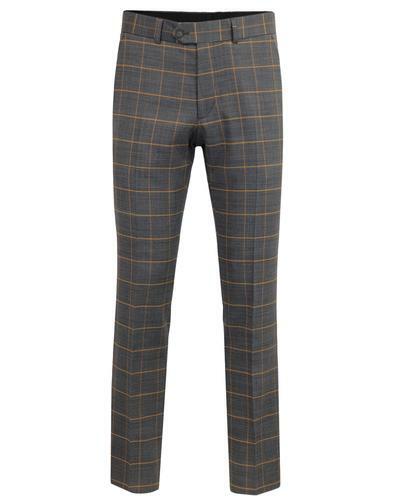 Gibson London 'Marriott' men's 1960s mod windowpane check trousers in charcoal. Featuring a stylish retro apricot (orange) windowpane check pattern. These Gibson London 'Marriott' suit trousers also benefit from 2 slant side pockets, button down jetted back pocket, classic belt loops and zip fly. Double clasp tab waistband fastening. A stylish retro slim cut suit trouser. 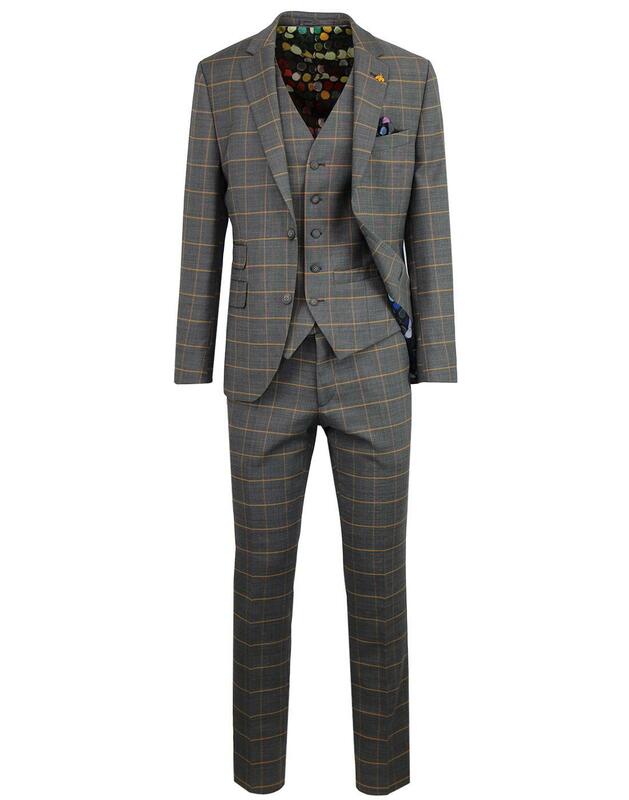 Gibson London 'Marriott' men's mod windowpane check suit trousers look great teamed with the matching 2 button 'Marriott' blazer and retro V-neck waistcoat for an awesome 3 piece suit! - Gibson London 'Marriott' men's 60s mod windowpane check trousers. - Retro slim cut suit trousers. - Apricot windowpane check pattern on textured charcoal ground. - Double clasp waistband fastening. - SKU: G18105MT Marriott Windowpane Check Suit Trousers. Composition: 52% wool, 46% polyester, 2% elastane. 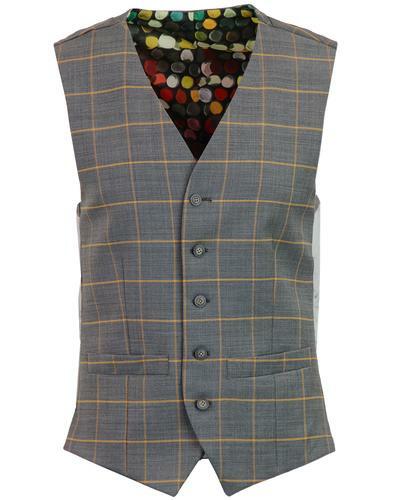 Gibson London 'Marriott' men's 1960s mod windowpane check waistcoat in charcoal with refreshing apricot strikethrough for a stand out retro vibe. Classic V-neckline waistcoat silhouette complete with shaped hem, light grey sateen back panel with tab adjuster and neat pocket details. The textured retro windowpane check fabric offers a hint of vintage country heritage styling. The waistcoat is finished with colourful interior lining. The Gibson London 'Marriott' men's tailored mod windowpane check waistcoat is sure to add a dashing and debonair edge to all manner of formal attire. 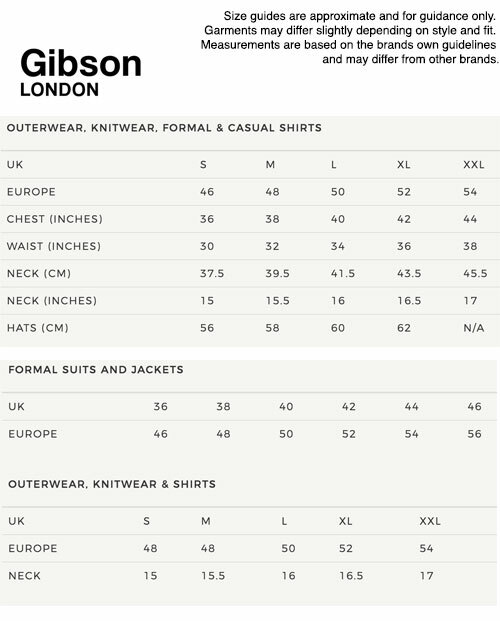 - Gibson London 'Marriott' men's mod windowpane check wasitcoat. - Charcoal with contrast retro check pattern in apricot. _ Light grey back panel with tab adjuster. - SKU: G18105MV Marriott Windowpane Check Waistcoat.